I know I haven’t been on much. I apologize for the silence. If you have been following along, then you know my move to Chicago could only be permanent if I found a job. I am very pleased to announce I have found said job, and internet service (and my life) has been restored. I celebrated my 30th birthday last week, and I have decided the universe gets credit for my birthday job (I got the call for my interview on my actual birthday). The first step in finding my happy place in the world has been taken. Let us hope more leaps forward are forthcoming. As for my books, I wish I could say I have been writing up a storm. Unfortunately, I seem to be completely out of synch with my creative inner voice. Perhaps it is that I am preoccupied with the enormity of how my life has changed in the last month- or perhaps that is what I am telling myself to let myself off the hook. Either way, my mind is in a different place than I would like it to be right now. Recently, a writer friend of mine passed away. She was elderly, and she knew it was coming. Still, at my age is comes as a shock when someone leaves your world. More so when you learn about it via e-mail. Since I am not feeling particularly creative, and since my friend is on my mind, I will tell you the parts about her that left a mark on my life. The woman who I will miss was named Evelyn McGraw. When I met her, she was already 90 years old. She attended the first writing group I was a part of, a group focused on indie writers that are new to the world of serious writing. Evelyn wrote lovely, old fashioned poetry. She often wrote about growing up on a farm, the novelty of her grandmother’s home when she was a child, or observations of the beauty in nature all around us. She had a great fondness for than changing of the seasons. Every piece she wrote was a lovely, positive reflection on the world. Her writing really made you appreciate the world through her eyes, though she never gave herself a single ounce of credit for the craftsmanship of her words. I often sat next to Evelyn in class. She was hard of hearing, and so I would repeat the advice and critiques that her peers offered up for her from out of hearing range. She always took advice and criticism gracefully, and applied that advice to her works. Some of those works can be found in A Tapestry of Verse, published by The Word Weavers Guild- edited by our fearless leader John Kelly. I was told they put out a second book this summer. I have yet to get my copy, so I am uncertain if Evelynn’s work will be in that book. Sitting and talking with Evelyn helped me to get to know her. I found out she got her pilots license in the 1930’s, when women rarely did such things. She never made a big deal of it, but when she spoke of flying it was always with fondness. One of my favorite things about Evelyn was that she seemed to get me. I’m a bit weird, and I write bizarre poems and stories (which you know if you have read my work). It’s always made me feel like I don’t quite fit in, especially with a traditional writers, like memoirists and historical writers-which is the predominant style of writer in the town where I am from. Evelyn never once made me feel anything but appreciated. She always smiled and said she was glad to see me every time we came to class, and I often got a hug as if she were a favorite aunt or grandmother. She praised my work, and more than once wrote on the top of my submissions not to change a word. I adored Evelyn, but it never occurred to me that I mattered to her too, until last April. Evelyn told the class she wasn’t going to be attending anymore, because it was getting too hard to make the trip. She wanted to have a “Christmas rehearsal” party, because she said she did not think she would live to see another Christmas. I wish she had been wrong, but I’m glad she had the foresight to plan it. 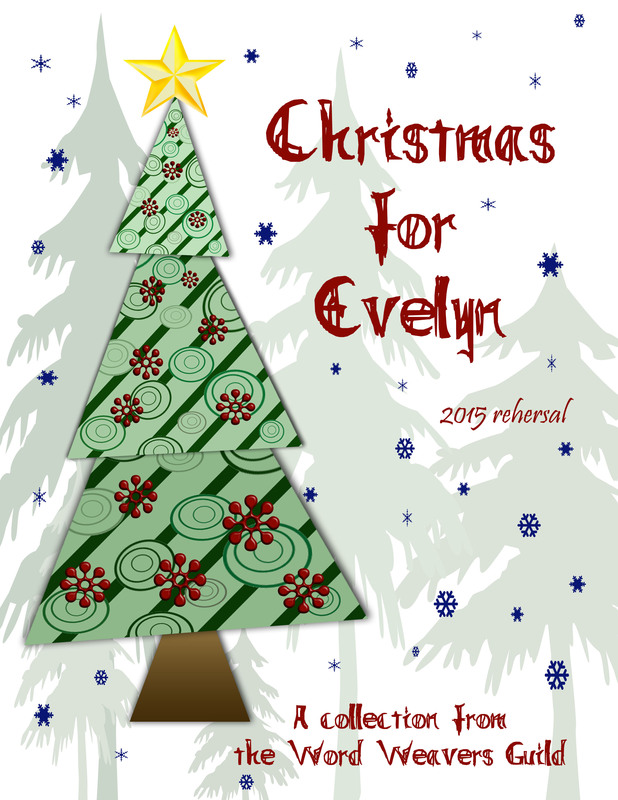 John asked everyone in the group to write a piece in their own style for Evelyn, and I was asked to made a cover image for a notebook we gave her to keep all of our gift works in. Most people wrote really touching letters to her about all the reasons we thought she was awesome. It was like a birthday party, where she was the guest of honor. She was happy, and you could tell she was very touched by how much we all cared about her. I, as I so often do, deviated from what everyone else did. I was asked to write a piece in my style for her, and that is exactly what I did. I thought about all the things Evelyn talked about in the couple years I knew her, and I recalled a poem she wrote based on an experience she had playing with old antiques in her grandmother’s attic. And so, I invented a story and set it to poetry about a little girl named Evelyn pearl (a play on the old fashioned term of endearment for someone you love or treasure) who goes up to play in her grandmother’s attic. I have posted it on my blog before, but I have included it at the bottom of this post so you can reared it in context of you would like. My eyes watered, and I gave her a huge hug. That’s the last time I saw her, and it is a beautiful memory to me. I love that fairy, and I still have her. She is all wrapped in bubble wrap back in California, soon to be sent to me here in Chicago. It’s funny how much a single person can impact your life, and how you don’t even realize it’s happened. Cherish the memories; even the small ones. Even if you are young. They always matter. That washed up on shore. Play folk of the sea. So I made the big crazy move to Chicago. I got here in one piece, more or less, my poor kitty in tow. He handled the plane better than I thought he would, but I did take him to the vet to get a mild sedative before I left. It truly is a different world than what I am used to. I’m from a small town with a majority senior citizen population, and everyone drives everywhere. Here everyone walks or rides the transit everywhere, and everything here is big. I mean, really big. I now live in a 16 story building, and it is dwarfed by the buildings on either side. Finding my way hasn’t been easy, and my roommate has been really patient with me, guiding me wherever I need to go. I don’t have a lot of pictures yet, because I haven’t done any sightseeing of any kind. I sometimes wonder if I have done something insane. I probably have, but Eff it! I’m here. I’m going to make it work. With that in mind, yesterday I joined a new witting group. This was my first time venturing out alone in the big city, unless you count the coffee shop a couple doors down from my building. And of course, I had to go to an evening writing group, because I never make anything easy on myself. Navigating home in the dark, luckily, was not scary at all, since one of the folks in my writing group lives in the same part of town as me, so I walked with him. I am in a reputable part of town, so it is unlikely I would be mugged, but still. I like the statistics better when I’m not on my own. Like everything in this foreign time zone, this group operates differently than the ones I have attended in the past. In this group, peer review has nothing to do with it. First they write independently of one another for about two hours give or take, then they gather for a discussion. My writing groups in the past would read six pages of a manuscript, then have a discussion where critique and review was offered, and then we would read the next manuscript. I even had one group that had a writing prompt at the beginning of every session. But hey, new city= new life + new method. I have to admit, reader, than I have not been inspired to write at all lately. Mostly I’ve been feeling overwhelmed. First with the last minute decision to uproot my whole life and move halfway across the country, and the chaos that ensued in my household. Then, the day after I got here I came down with a stomach flu. YAY. Also, I don’t have internet in my apartment, so I have to go downstairs to the coffee shop. Their Wi-Fi only seems to work in the front half of the building, which is always packed with laptop-mesmerized patrons. I lucked out on Monday and got a spot, but I couldn’t update my blog because I needed to use my precious internet time to apply for jobs. Nobody seems to use paper applications here anymore. So don’t be surprised if there are interruptions in my regular postings. I will try, but life happens. My friendly editor has the first draft of The Gatestone Chronicles: Fayling. I have some more work to do on the ending, but we are nearly there. Provided, of course, that I can find my way back to the world it takes place in. Hopefully things will settle down soon, and I can get back to my usual groove. Kristin Swartfager is working on the art for Timmy Tommy Tum, our collaboration project for kids. There have been a few delays with that, but never fear, we are still working at it. Well, that’s all that’s new in my world.